Impacts of bolides in the atmosphere may have caused the abiotic nitrogen fixation on Mars as nitrates. A recent research paper, led by Dr. Rafael Navarro-González and his team of scientists at the Institute of Nuclear Sciences of the National Autonomous University of Mexico in Mexico City, has demonstrated with experimental and theoretical models, that asteroid impacts on ancient Mars could have produced, fixed nitrogen, one of the main ingredients for life if the Martian atmosphere was rich in hydrogen. The presence of hydrogen could also explain how the planet remained habitable after its atmosphere thinned. The results are summarized in the work “Abiotic Input of Fixed Nitrogen by Bolide Impacts to Gale Crater During the Hesperian: Insights from the Mars Science Laboratory” which has been published in Journal of Geophysical Research: Planets, in January. This experimental and theoretical work by Navarro-González, a co-I of the HABIT instrument, has been highlighted this week at the news of NASA´s JPL website. This posts summarizes the latest news and discoveries from JPL’s dozens of active space missions exploring Earth, the solar system and worlds beyond and in this case focused on the recent experimental and theoretical analysis to interpret the observations of the Curiosity rover at Gale crater on Mars. 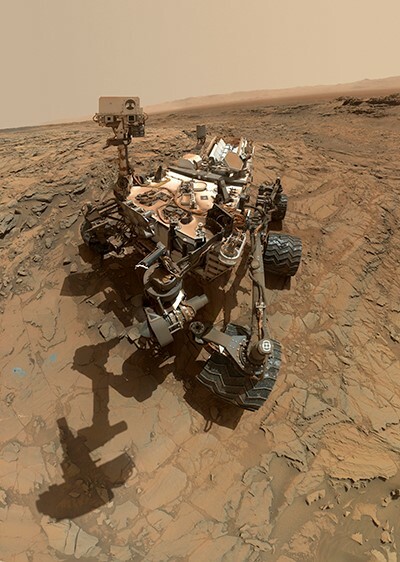 This recent paper is co-authored by researchers of GAS, Chaired Professor Javier Martin-Torres and Professor Maria Paz Zorzano Mier, who are also part of the Curiosity rover operation science team, and also part of the science team that had previously discovered nitrates, as a plausible source of fixed nitrogen for life, on Mars". In the lab, the team led by Navarro-González used pulses of an infrared laser beam to simulate the high-energy shockwaves created by asteroids slamming into the early atmosphere of Mars. The pulses were focused into a flask containing mixtures of hydrogen, nitrogen and carbon dioxide gases. After the laser blasts, the resulting products were analysed to determine the amount of nitrates formed. "The big surprise was that the yield of nitrate increased when hydrogen was included in the laser-shocked experiments that simulated asteroid impacts," said Navarro-González in his interview, to the JPL News Media, "This was counterintuitive as hydrogen leads to an oxygen-deficient environment while the formation of nitrate requires oxygen. However, the presence of hydrogen led to a faster cooling of the shock-heated gas, trapping nitric oxide, the precursor of nitrate, at elevated temperatures where its yield was higher." The composition of the early Martian atmosphere is still unknown, and it is very important to determine its past habitability, the planets equilibrium temperature and the presence of liquid water on it. These results may provide more pieces for solving this climate puzzle as well as for exploring abiotic processes for nitrogen fixation for life. Curiosity's Sample Analysis at Mars instrument continues giving researchers fundamental inputs for Early Martian atmosphere composition’s understanding.